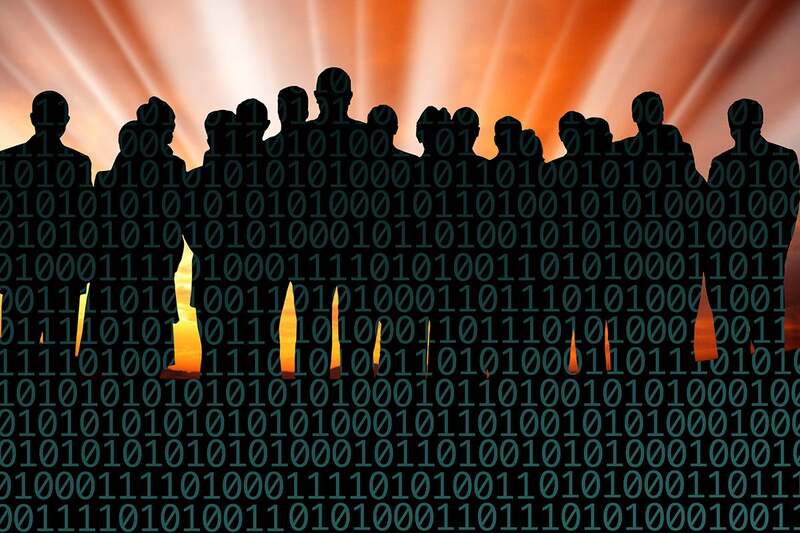 There are four potential roles IT can play in in its company’s digital transformation activities, ranging from an uninvolved “DX observer” to your company’s “DX leader." The difference is IT’s organizational clout and its ability to innovate. Which one are you? There are four distinct roles that IT can potentially play in its company’s Digital Transformation (DX) activities. These roles, illustrated in Figure 1, are Observer, Requestor, Implementor and Leader. The role that IT is allowed to play is based on two primary determining factors, IT’s organizational clout within the overall company and IT’s willingness and ability to innovate. IT’s organization clout is the amount of influence, respect and confidence the organization has toward IT. In other words, the organization’s willingness to listen to and accept IT’s advice and recommendations. IT’s innovative nature is IT’s motivation and ability to be creative and innovative on behalf of the company as a whole and within IT itself. As I go through these four types of DX roles, it must be understood, that there is no right or wrong, best or worst, only what’s most appropriate for IT and for the overall organization. The staff within IT are production oriented, rather than innovative or business-oriented by nature and as a result, have no real interest in becoming involved. As a DX requestor, IT has great innovative ideas, but don’t have the internal clout to push its agenda forward. This is the case because those within IT are creative by nature and interested in innovating. Those in IT may even have the culture, IT leadership support, time and tools to innovate. The issue, however, is that IT doesn’t have the organizational clout to prioritize non-IT internal tasks. Therefore, IT must first find an executive sponsor outside of IT in order implement their ideas. As a DX leader, IT is playing a major role in both defining the company’s DX strategy and playing a leading role is its implementation. For this to occur, IT must have the respect and support of the CEO and most of the C-Suite. This respect comes first through the design and creation of a flexible and cost-efficient computing infrastructure, reliable ongoing production operations, and on-time high quality project execution. In effect, high quality IT services are the table stakes for IT respect and the potential opportunity to be considered a business peer by other parts of the company. In addition to running a top-notch, effective and efficient IT organization, being a DX Leader requires a variety of business skills and knowledge, not only at the top, but throughout the IT organization. An example of this skills and knowledge can be found later in later in this blog, within Step 2. 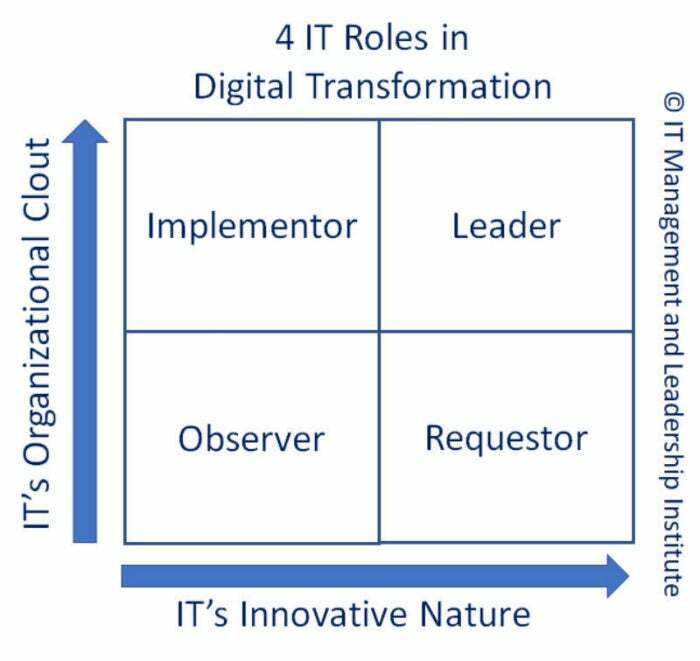 Before discussing how to change your IT organization’s current DX role within your company, I would like to reiterate, that there is no right or wrong, better or worse, there is just what makes the most sense for your company, IT as a whole, and those employed within the IT function. The reason there are only two paths to IT DX leadership is because IT must first have the organization’s technical respect and trust, created by flawless IT execution. Without it, IT will never gain the organizational clout to be the business partner, technical thought leader and internal change agent, that DX Leadership requires. The steps to make this organizational journey are listed below. Your goal is to assess each step and decide which steps are required, given your IT organization’s internal clout, and innovative nature. The business community (those outside of IT) think of IT as a single entity. I l call this the “One IT” concept. As a result, all interactions between IT and those it supports, whether it’s a call to the Help Desk, implementation of a new application, using email, or other IT-related touch, causes them to make an opinion, good or bad, about IT in general. Therefore, to maximize IT’s reputation, it must be as flawless as possible in all client-facing interactions. Being realistic, in some companies this will never happen, in others, IT plays a leading strategic role, and most companies are somewhere in the middle. That aside, the combination of Steps 1 and 2, combined strong business acumen, business sense, good ideas, and interpersonal communication can, over time, give IT a voice at the proverbial business table. If IT wants to be viewed as innovative, it must be willing to innovate. Creating and maintaining an IT innovative culture a difficult and methodical process. That said, my next post will discuss fostering an IT innovative culture. Don’t let IT’s great work be the company’s best kept secret. The majority of IT’s work is often in the shadows, outside the view of those it supports. Also, because of IT’s overall reliability, IT as become like the electric company, 100% uptime is assumed. As a result, IT doesn’t get any credit for its continuous production quality. This means the only time people think of IT is when a system goes down, project work is required, or an IT cross-charge is digging too deeply into someone’s department budget. If you want IT to be viewed as creative and innovative, be willing to talk (not brag) about the magnificent work IT is doing on behalf of the company. If you, the CIO doesn’t talk about it, who will? For IT to be a true leader in DX, or at least a valued player, it must be more than simply the technology experts. IT must be seen as a collection of business people who have a strong understanding of technology. It’s this “business first, technology a strong second” attitude that transforms IT from a vendor-like support function into a DX thought leader and the organization’s internal agent of change. In closing, this article is the perfect example of “it’s easier said than done.” This post should be viewed as a conceptual framework and food for thought on how to position IT in a way that is best for your company, IT, and all those working within the IT function.